We’ve been trying to feel the love for these things ever since they were announced, but we just can’t get our heads around the new Sony DSC-QX10 and DSC-QX100 lens-sensor modules, which are designed to attach to your smartphone. Anyone lugging around one of the QX devices gets to enjoy “image quality and creative options to rival a premium standalone [compact] camera,” with the 20-megapixel DSC-QX100 offering a decent sized 1″-type (13.2×8.8mm) sensor with a 28-100mm (eq.) f/1.8-4.9 lens,. 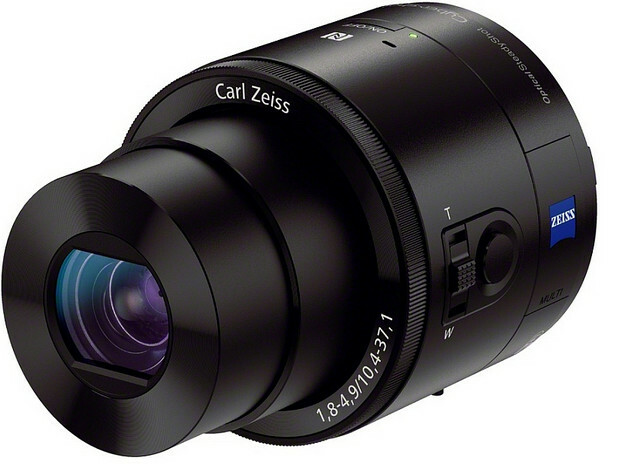 The lighter, 18-megapixel DSC-QX10 serves up a smaller 1/2.3″-type sensor with a more modest 25-250mm (eq.) f/3.3-5.9 zoom. Inside both modules can be found Sony’s Bionz processor, Optical Steady Shot and Wi-Fi with NFC (Near-Field Communications) features and both can do a decent turn at video too, rattling off 1440×1080-pixel movies at 30fps. Powered by a proprietary lithium-ion battery, the Sony DSC-QX10 and DSC-QX100 clamps on to your smartphone with a supplied adapter that fits most popular models. It’s not the most elegant solution we’ve ever seen. to be honest. Set to be released at the end of September, the Sony QX100 and QX10 “lens-style cameras” will be priced at £399 and £179 respectively. Who wants to drag one of these things around? Now, we understand where Sony are coming from and it’s a very bold move indeed. Bolting on one of these guys to your smartphone means that you’re liberated from using the teensy weensy little onboard camera, you’ll be able to take far better photos and and you’ll be able to swiftly edit and upload them via your phone’s connection. 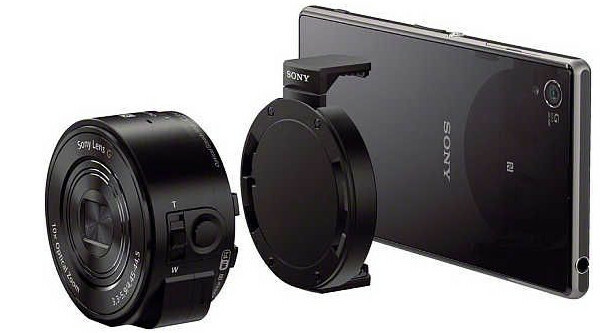 So Sony’s engineers have managed to solve the problem of introducing full internet connectivity and instant sharing to a high end point and shoot camera by making it team up with your smartphone. But with that ‘solution’ comes a fresh set of problems. 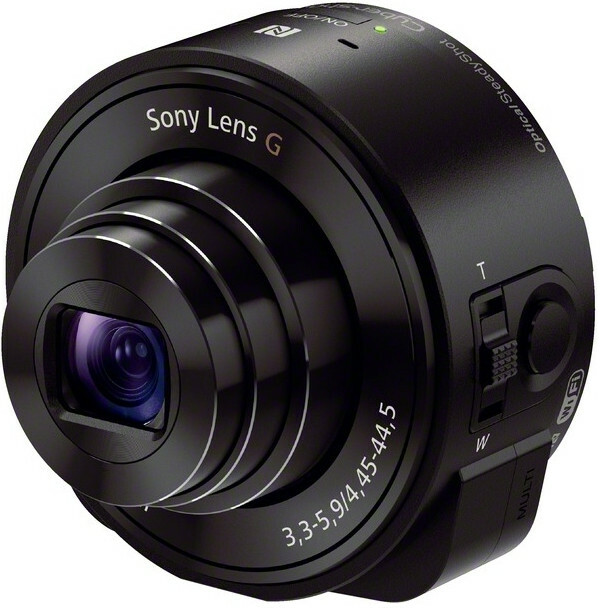 Most people who are interested in taking good photos probably already have a decent enough compact, and odds-on it will be more pocktable than the Sony QX models, whose cylindrical shape makes them rather bulky items to carry about. Moreover, the combination of a QX module and a smartphone is hardly a particularly ergonomic one, particularly when the bigger and heavier QX100 is coupled to a smartphone for any period of time. With no RAW shooting, no ISO settings, no flash, no AF assist lamp, no manual focus aids or manual exposure controls, there’s little here to entice enthusiast photographers. With high end smartphones coming with ever-improving built-in cameras – and there being no shortage of highly capable compacts coming in at the same price as the QX modules – we really can’t imagine too much consumer demand for the QX lens modules. But who knows? Maybe Sony will prove us wrong and the thing will go on to be a great hit. We certainly don’t think we’ll be buying one though, but credit has to go to Sony for throwing out this original curveball. Sony introduces two new products the Cyber-shot™ DSC-QX10 and DSC-QX100, which unite the creative power of a premium camera with the convenience of your smartphone. The lens-style cameras dramatically improve the quality of digital photographs captured on smartphones. Shoot and share fantastic photography and HD video using your phone, with image quality and creative options to rival a premium standalone camera. 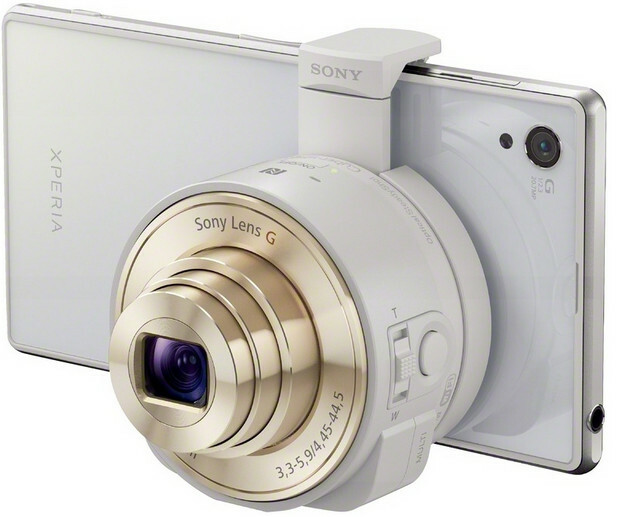 The Cyber-shot™ DSC-QX10 and DSC-QX100 lens-style cameras are a perfect partner for the new Xperia™ Z1 and other smartphones – transforming your mobile into a power-packed camera. It’s a dream come true for anyone who loves their smartphone, but wants the photo quality that only a dedicated camera can deliver. And whilst they look like lenses, the DSC-QX10 and DSC-QX100 are complete cameras in their own right. The DSC-QX10 and DSC-QX100 attach easily with the supplied smartphone attachment that fits several popular smartphone models (width 54-75mm/max. thickness 13mm). Connection to your phone is made via Wi-Fi, and the latest version of Sony’s PlayMemories Mobile launches automatically. For NFC smartphone owners, linking is even simpler with easy One-touch connection established without any complicated settings. Explore a whole new world of creative imaging possibilities – use your phone screen to view shots, adjust settings and share images instantly via any of your phone apps. You don’t even need to have the phone and camera attached for it to work – the phone can act as a handy ‘remote’, simply place the new Cyber-shot™ exactly where you want it, and fire the shutter direct from your mobile – perfect for grabbing high-angle shots or self-portraits. Weighing just 105g (with battery and Memory Stick Micro), the Cyber-shot™ DSC-QX10 partners an 18.2 effective megapixel Exmor R™ CMOS sensor with a high-quality Sony G Lens and basts a powerful 10x optical zoom range. It is great for power-packed close-ups of people, fun-filled events and distant landmarks that are just not possible without a dedicated zoom lens. Built-in Optical SteadyShot combats camera shake, keeping handheld pictures and videos steady and blur-free, even in low-light conditions. The Cyber-shot™ DSC-QX100 features a large 1.0-type Exmor R™ CMOS sensor with 20.2 effective megapixels. You’ll really see the difference with sumptuous, ultra-low noise images – even indoors or at dusk when many cameras and camera phones struggle. It’s simple to frame shots and change camera settings like aperture control and exposure compensation and photo/video record mode on your smartphone’s big touchscreen. There is far more creative control than you can ever get with your phone’s regular camera, enabling the user to capture beautifully background defocused shots. Everything is easily accessible, with extra dedicated keys for fingertip control of zoom and shutter release on the camera body. Teamed with a wide-aperture Carl Zeiss Vario-Sonnar T* lens with 3.6x optical zoom with Optical SteadyShot, it allows all the picture quality you’d expect from a premium pocket camera. Accessory options include a soft carrying case1 and dedicated camera attachment case2 for a perfect fit with latest models from Sony Mobile including the brand new Xperia™ Z1. 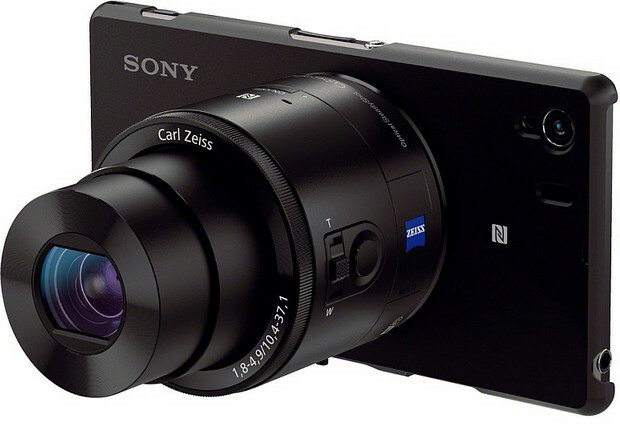 The new Cyber-shot™ DSC-QX100 and DSC-QX10 from Sony are available to pre-order from sony.co.uk now. They’re on general sale in UK from the end of September 2013.